Stage 1: Here you can see that I have taken a block of hardwood, and attacked it with a saw on the front corners, to create a more interesting, contoured shape. After roughly cutting chunks from the corners with the saw, I used rough files to smooth the surface and shapes a little, and round off any sharp edges. Stage 2: I knew that I wanted to create a sort of stepped or terraced effect with the earth, like some sort of ancient, rough wooden stairs that have been half-buried and weathered with time. So here you can see that I have started to roughly build up the general shape on top of the base, using some balsa wood, glued on with PVA glue (white glue). Stage 3: Once the glue was dry, I used a scalpel to clean-up, cut and shape the balsa, making the 'step effect' more apparent. Stage 4: Here I have made the the actual wooden 'steps', again using balsa. It is very easy to create the wood grain texture: I used a stiff wire brush, and just scraped along a piece of balsa repeatedly in one direction, following the real grain of the balsa. The balsa is so soft, that is quickly becomes distressed, so you don't need to brush too much. The wood texture appears very rapidly, in any case. Then, I just cut slabs from the balsa, like wooden planks, and stuck them onto the base to represent the steps. Once dry, I painted all the balsa with some diluted PVA (about 50:50 glue:water), to give it a bit more strength, and also to semi-seal the porous surface, creating a better surface for painting, later. Stage 5: This stage shows the answer to a question I am often asked: how to create a smooth back or side to a base that has been built-up in this way? As you can see, the method I use is very simple. I just take a piece of thin plastic (in this case, a piece of plastic cut from a normal blister pack), and stick it on the back! Then, when the glue is dry, just cut the excess plastic to shape, apply some milliput over the edges, and then use sandpaper to ensure a smooth join with the other sides of the base. 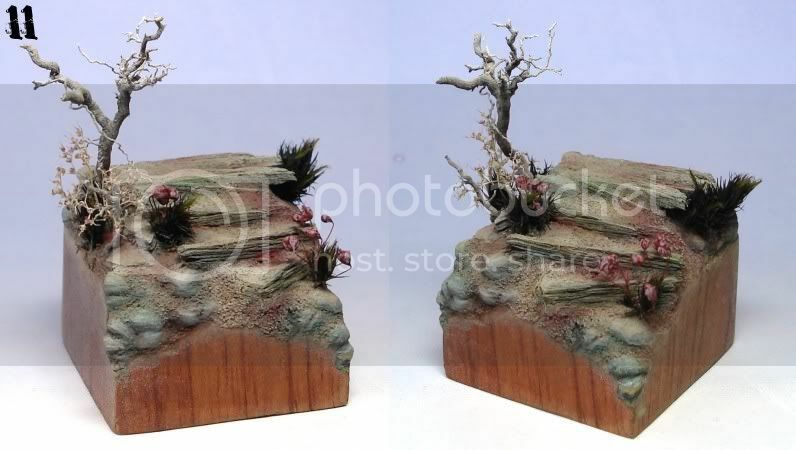 Stage 6: Here I have started to add some other scenery elements to the base. 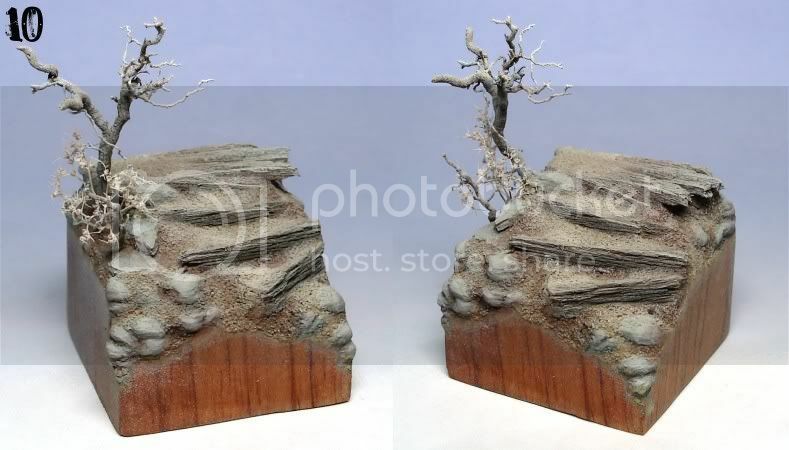 I find it works best if most of the major scenery is applied before gluing on the sand, because then you can 'bury' the scenery bits a little when the sand is added, making them appear a more natural part of the environment. I used a piece of root (saved from a gardening session!) for the tree. Roots often give a great, interesting shape, and if you choose carefully, they can be quite durable and 'tough' as well, making them perfect for a base. I simply drilled a little hole in the base, and inserted one end of the root, using PVA glue to secure it. 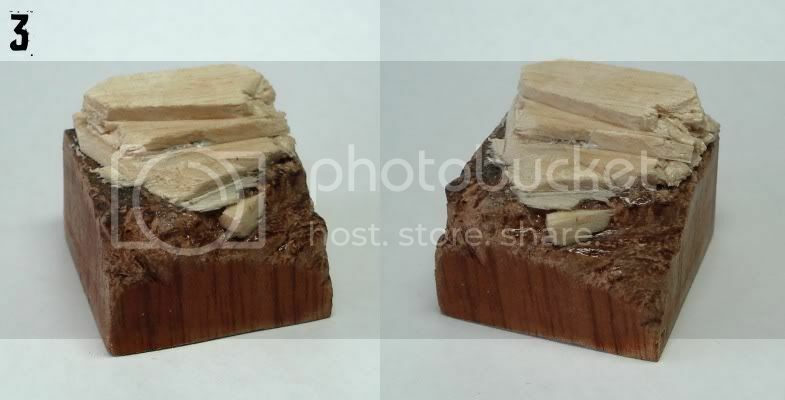 The rocks: often I use pieces of cork, roughly shaped with a scalpel and filed semi-smooth, to represent rocks. But sometimes it can get frustrating trying to find the right shapes to fit the base you've made. So often it's easier to just make your own rocks with milliput, by sculpting them directly onto the base – which is what I have done here. I just applied some chunks of milliput here and there, trying not to be too uniform with the size, and then made some rough rocky shapes using a metal sculpting tool. Once the milliput had dried a little, I used a real rock and pressed it gently onto the surface here and there, to create some texture and a more 'rocky' look. Stage 7: In these photos, the sand has been applied (at last!). 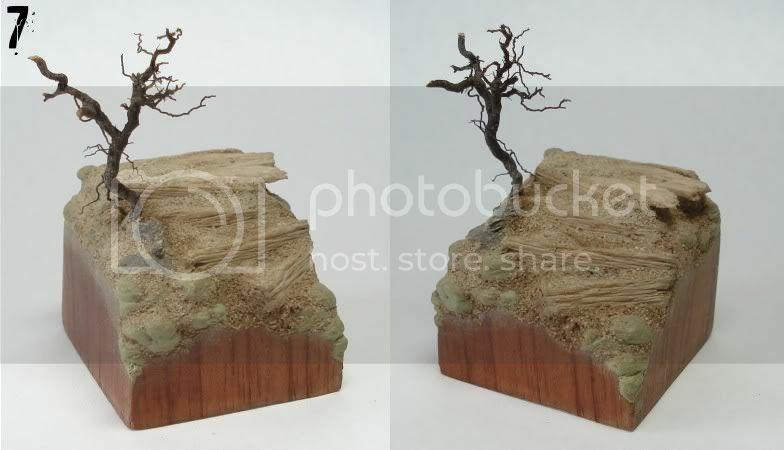 Two layers of sand usually looks best, I think – it give a more natural covering. The surface of the base is painted with PVA glue, and then the sand is sprinkled on top. 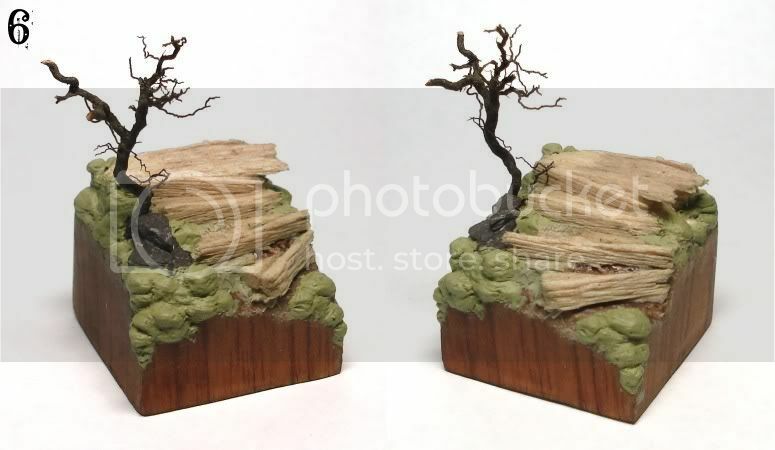 You can see how 'burying' the scenery elements makes them look more natural than they would otherwise, because it mimics the way earth fills in cracks and holes between rocks etc. in real life. Stage 8: Here I have applied a little bit of colour to the base. I just painted the rocks a dark grey colour, and the wood dark brown also, so that I could establish some initial 'dark zones' on the base before applying some white undercoat. I have also added a few extra little bits of scenery. Stage 9: For this stage, I applied some white spray undercoat to the base. I don't always undercoat my bases, but sometimes it can create a better surface for painting, and also help to establish some general lighting, making the job of painting easier. So in this example, what I have done is spray the undercoat only from one direction: from straight above the base (zenithal lighting). 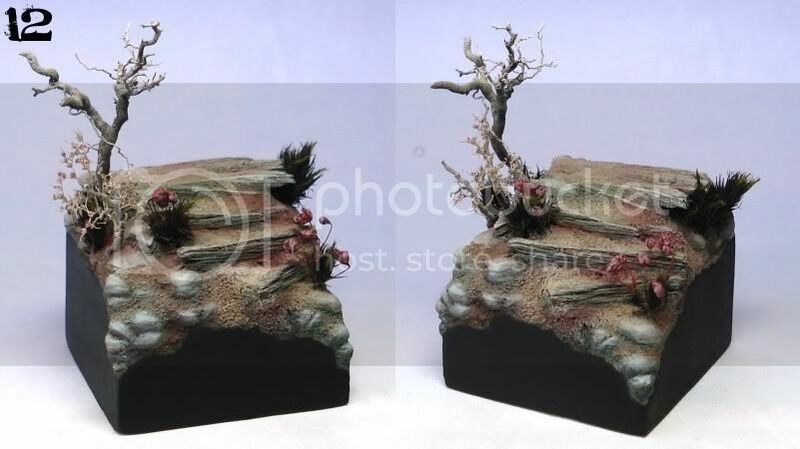 By doing this, the 'darker zones', the areas of shadow on the base, are preserved. This is a simple way of obtaining a fast lighting effect. Basically, if you spray a white (or light-coloured) undercoat from one particular direction only, this mimics the effect of light coming from that direction, because the spray paint hits the surface where the light would be most direct, and misses the area which would receive little light (and therefore be shadowed). Stage 10: I have switched to a blue background for the photos from now on, because I am starting to apply the colour to the base, and the blue background gives more accurate and easy-to-see pics for this. The colours are pretty self-explanatory, from looking at the photos I think. 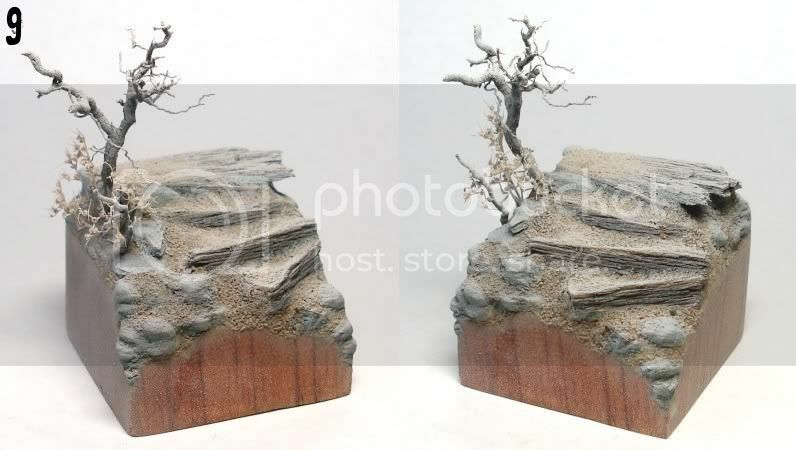 Just some very dilute red-brown (like GW dark flesh + a little black) for the reddish touches on the earth, something like dark scorched brown on the wood parts, some sandy yellow-brown colour on the rest of the earthy parts, again very dilute, and some fairly neutral green-grey colour on the rocks, with very light grey for highlights. Some light grey was drybrushed on the sandy parts to reveal the texture a little more. Stage 11: Here I have added some more scenery bits, some plants and flowers. Again, they are applied by drilling a small hole in the top of the base, poking in the tip of the plant and gluing in place. The flowers were given some rough and quick shading and highlights with pink/red colour paint. The colour was enhanced on the rest of the base using pigment powders. In this case I just used artists' soft pastels, which are like coloured chalk sticks – it is easy enough to scrape a little powder off the stick using a knife. 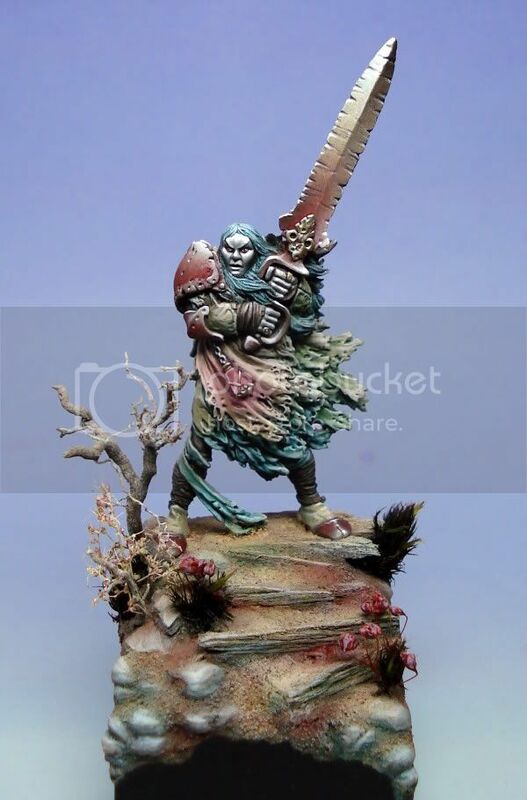 The powder can be applied onto the base dry, with a brush; mixed with water and applied as a wash; dissolved in white spirit and painted or washed onto the surface...there are many different effects that can be achieved, so it is worth experimenting a little! Applying some layers pigment powders onto the sand-covered areas of a base give a great 'earthy' texture I think, because the powder is very fine-grained, and by sinking in between the larger sand grains it gives a softer, more real-looking earthen texture. Some stronger red pigment was used on areas of the earth, for some touches of brighter colour; also some darker greyish blue-green applied around the rocks in places. Some yellow greens were applied to the wood, also. Stage 12: For the last step, I have applied some extra highlights on the rocks, and other prominent places, with a white-grey colour paint (VMC silver grey). 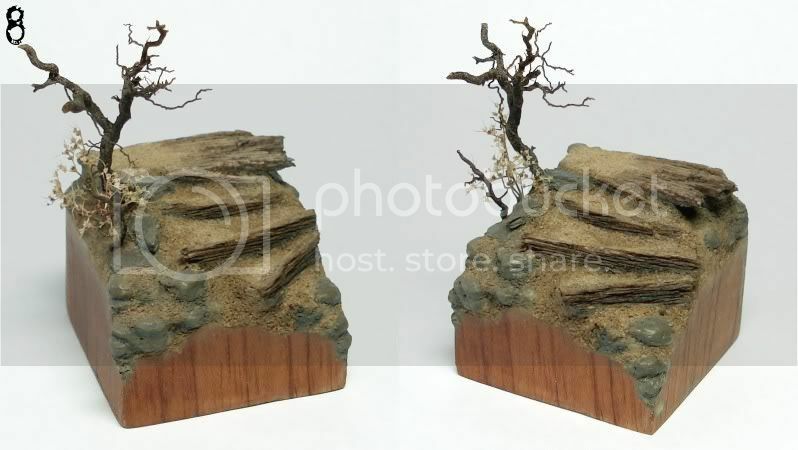 I have also added some extra drybrushed highlights on the sandy parts of the base. I also emphasised some of the darker shadows using very dark blue-green. And of course, I have painted the sides of the base black, to finish! Well, I hope that is useful to some of you – it's not the most comprehensive article, but it might give you a few ideas, or insights into the process. See my site www.guildofharmony.com for more pics!